Winter season is at its peak and why not to spend a few hours, day, weekend or maybe even entire week enjoying the snow? Yes, you hear it correctly in Spain you also can enjoy the snow and the winter sports! And for sure one of the best places to do so is the Sierra Nevada. The Sierra Nevada which literally means snowy mountain range is a mountain range in the province of Granda in the most southern region of Spain called Andalusia. Sierra highest point is 3478 meters above sea level which is the tallest in Europe outside the Caucasus Mountains and the Alps. It is also one of the most Southern sky resorts in Europe making it possible to enjoy the sun and beaches one day going to ski to the mountain another day. The resort of Sierra Nevada opened in 1964. The top station is at 3300 meters hight above the sea level. In total there are 125 tracks which in total sums the length of 106.8 kilometers of marked pistes. All tracks are indicated and divided based on the difficulty. You have 19 very easy runs indicated in Green, 42 easy Blue runs, 50 hard runs marked as Red, and 7 very difficult runs in color Black. In addition to that, you have 7 snow parks as well as Mirlo Blanco area where you can enjoy Russian Sleigh, Toboggan-runs, Sit-skiing, skate skiing, skibobbing, Mini-ski, snowboard mini. Moreover, snow rockets, children’s snowmobiles, skicross, sledding, slalon are also available. For those who prefer to enjoy mountains in a different way, the Sierra Nevada is also offering other activities. You can relax at the SPA, or see a Sunset from the Veleta peak. If you want something more extreme you can try Paraski by flying over Sierra Nevada ski slopes in tandem paragliding and lands skiing. There are also cute little bars, hotels to enjoy your holidays in The Sierra Nevada. More information about the resort, bookings and season times can be found on the main page of the resort. The Sierra Nevada is not the only skiing resort in Spain. San Isidro and Leitariegos in Castilla, Valdaesqui in Madrid, Vallnord and Grandvalira in Andorra as well as Formigal in Huesca. The prices in different skiing resorts are very different. Leltariegos normally has the lowest price which is around 22 euros for one day or 12 euros per day if you book it for 7 days. 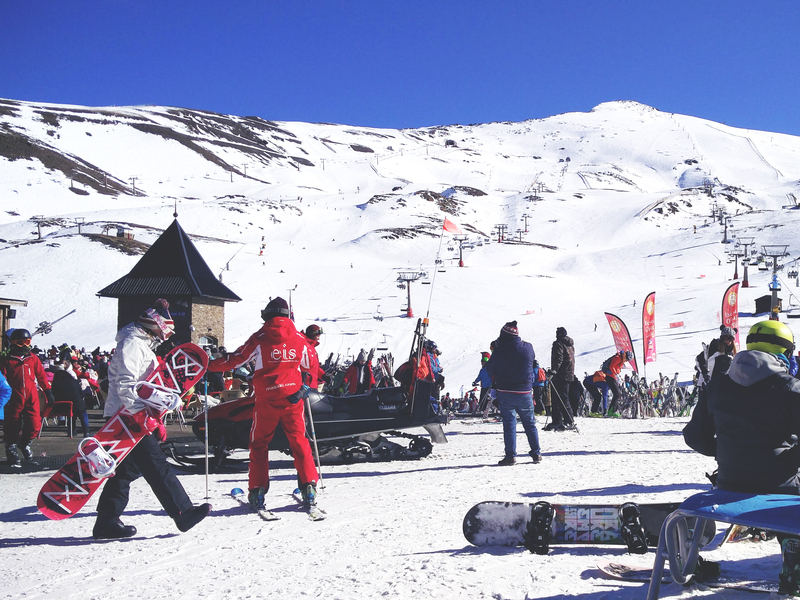 The Sierra Nevada together with Grandvalira is the most expensive skiing resorts in Spain. Here 1 day to ski will cost you 48 euros and around 40 euros a day if you get a seven-day pass. The kids until 6 year old and alders of 79 years old and more do not have to pay. Please have in mind that the prices are not including skiing nor snowboarding equipment. Thus, if you don’t have your own attributes be prepared to pay even more! Just for information: skis to rent will cost you from 10 euros a day per person. We would highly recommend to buy your own clothes rather than renting or buying it at the resort. You can make it way cheaper and you will be able to get used to it for upcoming years! Ready to jump on the snow? Reserve your tickets and holidays with time otherwise you might be left only with a wish!